As the Spanish Empire’s main port in the Americas during the colonial era, Cartagena has a rich and diverse history. It sits on Colombia’s Caribbean coast and is just two hours away from Baranquilla (Colombia’s 4th largest city). Cartagena’s colonial history makes it a melting pot of African, Caribbean and Spanish influences which can be seen in the diversity of its people, its beautiful architecture all the way through to its cuisine. It also boasts idyllic and instagrammable backdrops at every corner. I spent 5 days exploring the Colonial city and its surroundings. Whilst it does have a resort feel, it’s not overwhelmed by Western tourists - offering a different travel experience to some other more popular destinations in the region. Whether you’re seeking adventure, relaxation or an engaging cultural experience, Cartagena definitely offers a little something for everyone. Cartagena isn’t exactly a top snorkelling spot but there are some beautiful coral reefs in the Rosario Island national park. You can book a snorkelling only excursion from one of the Islands within the national park for as little as $30,000 COP (Around $10 USD or £7 GBP) or you can find a Rosario Island Tour which includes a snorkelling excursion. Depending on when and where you go, you can see everything from schools of brightly coloured fish and sharks or dolphins to eery plane and shipwrecks. For a crossover activity between adventure and relaxation head to el Volcan de Totum. It’s a very small active mud volcano located in the village of Totumo, about a half an hour drive from the city of Cartagena. Here you can climb the steps of the tiny 15m volcano, to lounge in the warm dense volcanic mud. The mud is said to have healing and medicinal properties and you can even get a massage in the mud bath, for a small fee of course. After the volcanic experience, you can bathe in a small nearby lagoon to remove all of the mud. Make sure you take a minute to really soak in the views from the lagoon - it’s truly breathtaking. Although the city of Cartagena itself is on the coast, it isn’t home to beautiful Caribbean beaches that you might imagine. However, venture a little further away towards Playa Blanca and the Rosario Islands where you’ll find a whole world of white sand beaches and clear blue waters. As well as taking us to the Famous Playa Blanca, our group tour made a stop at party island Cholón where we enjoyed a drink or two at the bar in the sea. 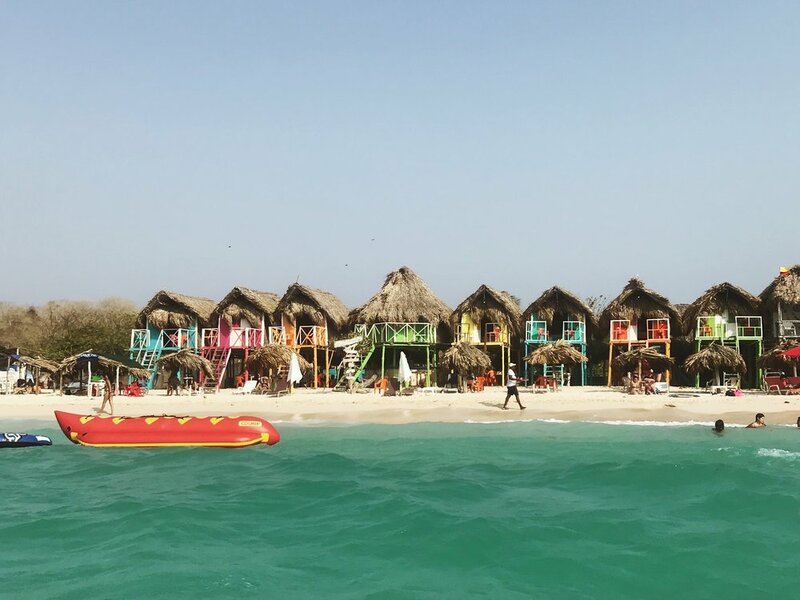 You can take a group tour from Cartagena, which will include a bus ride to Playa Blanca before boarding a speedboat to explore the other islands in the National Park, or you can rent your own boat and enjoy the islands at your leisure. We opted for a group tour which included a snorkelling excursion and lunch. This worked out to be around £75 per person but may be cheaper if you book locally. Private boats were advertised from around $675 USD (£515 GBP) per day. Several taxi drivers offered to take us to Playa Blanca but I’m not sure this would be the most cost effective nor the safest option. If you have time, I would highly recommend spending a couple of days on one of the larger islands within the national Park. You can discover the beauty of Isla Grande, exploring Orica, the local village and taking advantage of the quieter beaches like Paraiso Secreto and Playa Libre for a truly relaxing and authentic experience. Alternatively, you can book into a more exclusive Island like Isla Carolina. From there you can then take day trips out to the other Islands within the National Park. As a UNESCO world heritage site, the walled city of Cartagena offers a variety of cultural exploits. I would highly recommend taking advantage of one of the free walking tours that depart daily from Plaza de los Coches (under the clock tower). This will help give you a brief overview of the history of the city and offer insight you might not get otherwise. We didn’t manage to make it to the Castillo de San Felipe de Barajas. However, if you have time be sure to visit this important bastion. 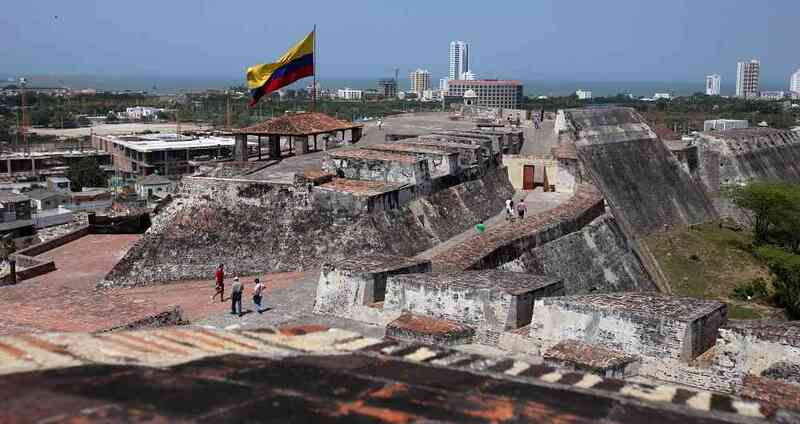 It is the most impressive fortress built by the Spanish empire and survived many siege attempts. At the Castillo you can take a guided tour or grab an audio guide to learn more about the fortifications of the castle and its significance to the Spanish Empire. Knowing where to eat when on holiday can be such a difficult task. There really is nothing worse than sitting down to what you think will be an new and interesting culinary experience. Only to be disappointed by a lack-lustre menu or poorly executed food. To avoid disappointment, I would highly recommend Espiritu Santu for lunch and/or San Valentin for dinner. Espirtu Santu offers a rustic canteen style restaurant, serving specials of the day as well as some a la carte options. It’s not fancy food by any stretch of the imagination, but it’s authentic and very well priced. You can tell it’s the place to eat by the sheer number of local Colombians who fill its seats for lunch each day. San Valentin is a little swankier, with meals coming in at a slightly higher price. San Valentin is a more refined in its decor but still offers a vast array of dishes offering Caribbean inspired seafood plates as well as American style meaty platters. Cartagena really has a lot to offer, you can spend a good few days simply getting lost in the culture or get stuck into some more adventurous exploits in its surrounding areas. In any case, it ‘s not one to be missed. Let me know below which of the three holiday styles sound more like you! Make sure you’re following on Instagram to see more snaps from Cartagena.